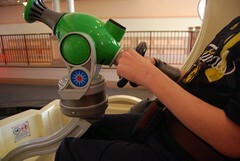 We were not planning of doing another review of Toy Story Midway Mania, but we ended up with some new insight on the wheelchair accessibility this time. The one thing we noticed for the first time was Cast Members trying to load us load at the regular loading area and having to tell them we wanted the wheelchair vehicle. In the past they always just had us go down the hall, but now they seem more proactive about loading those that can transfer at the regular loading area. The other reason we decided to do another review is related to the lap bar. In the past they always removed the lap bar along with the seat when Mik rode in the wheelchair vehicle. This time, though, they left the lap bar on. Mik hated that time we went around because he always freaks out when something presses against his stomach due to his baclofen pump. The bigger issue though is the blaster is stuck a certain distance from the lap bar, which meant despite almost totally being squished against him he still had trouble controlling it easily. The lap bar incident happened on Friday, June 3. On Sunday (our last day of this trip) they asked if the lap bar was okay and we told them that did not work for him. It then took them at least 15 minutes to get the the metal piece they put on when the lap bar is off on so that we could ride. The piece goes on top of the metal bar the lap bar attaches to and it took 4 CMs before one finally got the pins into the holes that holds the metal piece in. Later that week I heard online that the wheelchair vehicle was down for service not only in California, but also Florida for this ride. Our main review of Toy Story Mania can be found here.